First post by Megan Stulberg! I’m fairly new to veganism, and honestly? I’ve never been a huge fan of vegetables. However, I’ve been making a lot of personal changes in the past few months and improving my dietary health is a big part of that. I’ve been trying my best to sneak greens into every homemade meal possible and so far, so good! Loving kale is one of the best things you can do for your bod. It’s significantly high in fibre, iron and calcium. Read more about all the health benefits of kale here. Serves 2. Feel free to double or tweak the recipe! 1. Heat the olive oil in a medium skillet over high heat. Turn down to medium heat once the oil begins to sizzle. 2. Add the chopped onion and garlic first, then the mushrooms. Cook for 4-5 minutes while stirring the vegetables occasionally. Once golden-brown, add the kale. Cook for an additional 2 minutes. Add more oil and a pinch of salt if necessary. Once done, set cooked ingredients aside in bowl. 3. Bring a medium pot of water to a boil. Place the sweet potato in the water and cook covered for 5-7 minutes until tender. Rinse the sweet potato under cold water and peel carefully. 4. Mash the potato in a bowl with 4 tbsp water (add milk and vegan butter if desired, but not necessary). Set aside. 5. Heat the pan with another dash of olive oil and place one tortilla in the skillet. Grill for 1-2 minutes until golden-brown, flip and wait another two minutes. Repeat with each tortilla. 6. 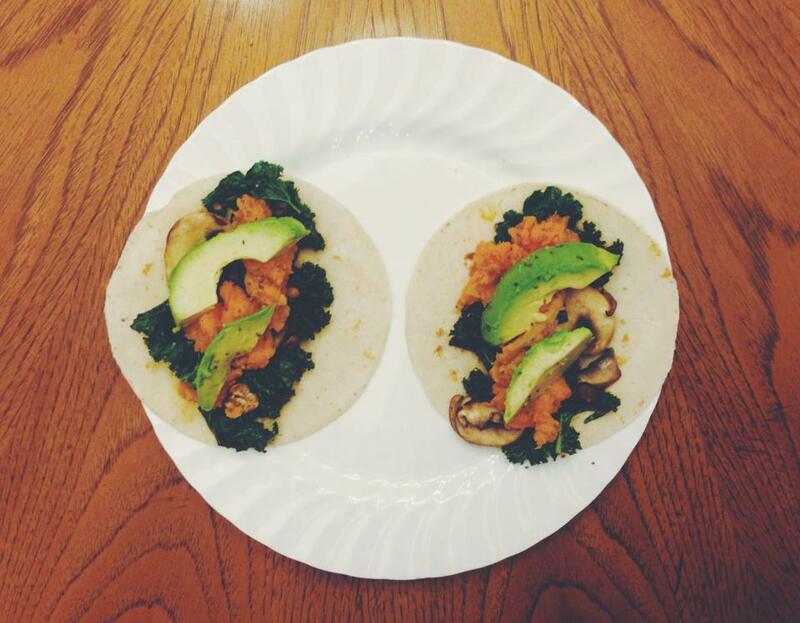 Fill each tortilla with the mushrooms, sweet potato mash, kale and avocado. Sprinkle chia seeds on top. Drizzle with hot sauce or additional condiments if desired. Serves 2 meals or 4 side salads. 1. Massage the kale leaves with olive oil, lemon juice and salt. 2. Cut off the crown of the pomegranate and discard. Slice the rind and place the fruit in a large bowl of water to avoid a mess. Proceed to break apart the pomegranate. Drain the seeds. 3. Drain the can of chickpeas (they’re already cooked!) and heat in a pot on medium-low heat if desired. If you are using dried chickpeas, use this helpful guide here. 4. 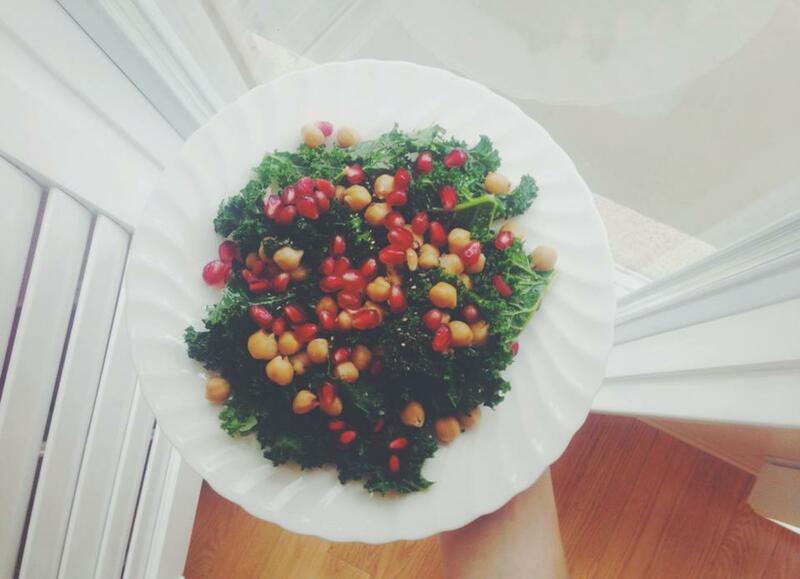 Combine kale, pomegranate seeds and chickpeas in a bowl and toss. Before serving, top with chia seeds for extra fibre. 1) Using a food processor blend the cauliflower, chickpeas, cashews, garlic, tahini and lemon juice into a thick paste. Taste before you set aside and add more garlic or salt if desired. 2) Add a splash of olive oil in a medium skillet on high heat. Lower to medium once the oil begins to sizzle. Add the kale to the skillet, mixing with salt and a touch more oil. If preferred, skip this step and use it raw. 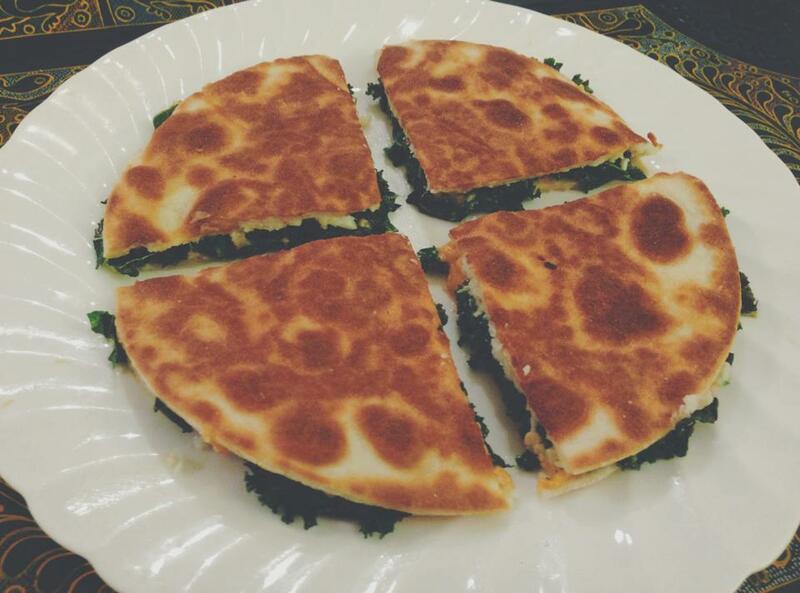 I just like my kale to be warm and soft in a quesadilla! Set aside. 3) Heat the skillet up again and throw in a tortilla. Spread the hummus onto it evenly, top with kale and Daiya, and place another tortilla on top. Grill for 2 minutes, pressing down on the quesadilla with a spatula to keep the ingredients melting together. Flip and grill the other side until golden-brown. 4) Enjoy! If you’re feeling like going all out, add some black beans or whip up a cashew sour cream to go along with it. 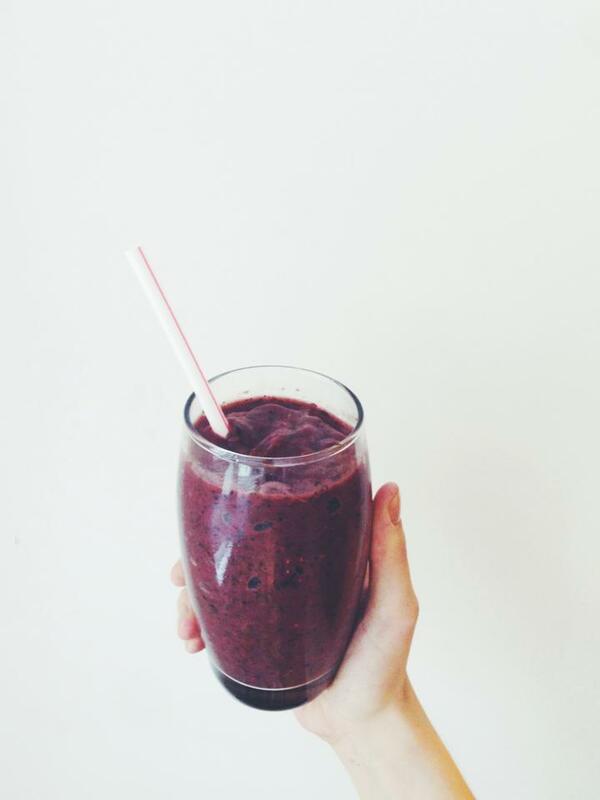 1) Place all ingredients into the blender. 2) Blend on high-speed, stopping to stir occasionally if needed. Blend the ingredients together until a thick consistency has been reached and the kale is no longer visible. Note: If you’re using all fresh vegetables instead of frozen, simply add ice before blending! 1) Boil water and cook the rice in a covered pot for about 7 minutes. While the rice is cooking, preheat your oven to 375 degrees. Lightly grease your springform pan or casserole dish…this is important! 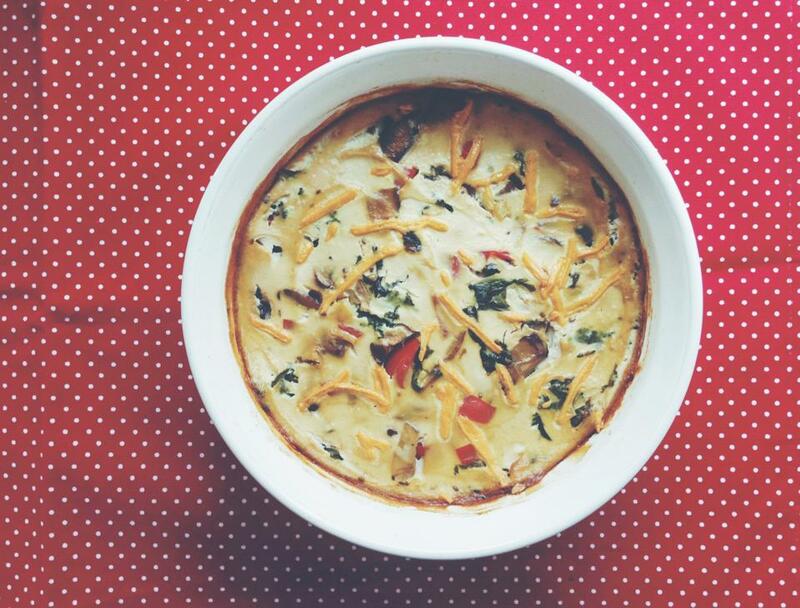 Otherwise your frittata will be a mess to serve. 2) Drain the cooked rice and mix it with the flax egg. Press the rice into the bottom of the dish flat and lightly brush a little oil on top. This will act as the frittata’s crust. Place inside the oven and let it cook for about 10 minutes. Take this out and leave it to the side. 3) Next, heat some oil in a large skillet. Add the garlic, mushroom, red pepper, oregano, basil, kale and salt. Sauté the veggies for about 10 minutes until the garlic is soft and the greens are wilted. Turn down to low heat. 4) Next, drain the tofu and place inside a food processor. Add the nutritional yeast, soy sauce, chia seeds and almond milk. Blend until a smooth consistency has been reached. 5) Remove the skillet from heat and add the tofu mixture to it. Mix it together with the vegetables and then pour everything onto the dish on top of the rice crust. Sprinkle on Daiya on top if desired. Note: At this point your frittata will look like a big pile of hummus. Don’t worry! That’s supposed to happen. 6) Place the dish inside the oven and cook for about 40-50 minutes. Mine took a little longer but cooking times will vary, so check on your dish regularly. Remove when the top of the frittata has started to brown. Let it cool for about an hour, then serve.